With the weather being so changeable these days it’s hard to decide whether we should still be eating summer-inspired or autumnal dishes. With that in mind, I thought a ‘autumnaly salad’ was probably the best way to go forward. Perhaps it’s the simplicity of a traditional Greek salad that I’ve always loved, but it doesn’t exactly feel like a meal, and rather more of an accompaniment. 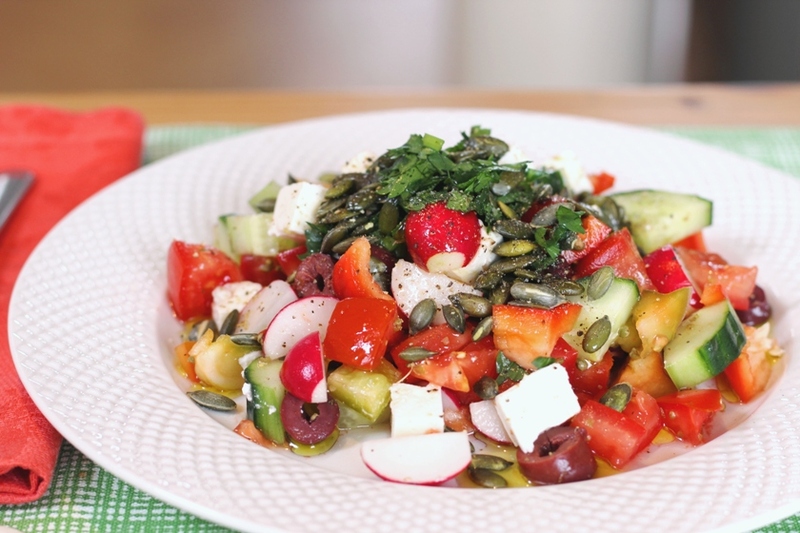 So this goddess of Greek salads was created to make a more substantial and wonderfully colourful lunch. You know you’re onto a nutrient packed meal when it’s colourful (naturally colourful, not E number colourful, that is) as well as fresh! VITAMIN A DID YOU SAY? So why enjoy this salad other than because it’s delicious and satisfying? Well it’ll be sure to give you a hit of vitamin C, fibre, lycopene, and carotenoids (from carrots and other orange and red coloured fruits & veggies); a form of pre-vitamin A. Wait, vitamin A did you say? I can almost sense your quizzical look appear with the mention it. That probably rings a bell as to a vitamin that you should avoid. But this is not exactly true. There are basically two types of vitamin A; carotenoids (from fruits & veggies) and retinol (from animal products). Vitamin A from retinol is more easily absorbed, and we therefore get a higher dose of it when we eat foods that have this type of vitamin A (such as liver). On the other hand, in order to get our vitamin A from carotenoids, our body has to convert it into a more available type of vitamin A. When it comes to pregnancy, vitamin A is still very important to maintain adequate growth and development of the baby. Remember you mother saying that eating carrots will give you night vision? Though we know that was mainly just a way to get us kids to eat more carrots, it does have some nutritional foundation. Perhaps not so surprisingly then, a mother’s lack of vitamin A during pregnancy is the leading cause of preventable blindness in babies. The need for this vitamin is particularly important during the third trimester when the body’s demands for it increase. It also helps women recover post-birth, aiding with tissue repair. So, why all the scare about vitamin A? Vitamin A in the form of retinol can be toxic in high quantities, and cause birth defects as well as liver toxicity. And as vitamin A is stored in the liver, we tell you to avoid eating liver while pregnant, as this contains high amounts of retinol. So the easy solution to make sure you are getting enough carotenoids is to eat plenty of colourful fruits & veggies,as you can’t really overdose on vitamin A from carotenoids. This will ensure you get some vitamin A, but not too much! Carotenoids, when consumed with fat, are better absorbed, so in this salad the olive oil and feta cheese are a great pairing. If you want to make your lunch even more substantial, adding an egg is the perfect accompaniment to ensure you get the most of those carotenoids! Chop all the veggies, olives and feta cheese up, and place in a large bowl. Mix in the oregano, olive oil, vinegar, salt & pepper. Lightly toast the pumpkin seeds until they just begin to pop. Once you are ready to serve your salad, place a sprinkling of pumpkin seeds on top, and enjoy!